These questions and answers are a work-in-progress. If you need more information on any topic, or can’t find the answer you need, please contact us here. Why do you have a section for conspiracy theories? A number of those who oppose the Hundertwasser campaign have resorted to spreading mis-information. We don’t know if their intention is malicious, if they are poorly informed or if they are sanity-challenged, but since they insist on repeating untruths we need a place for people to check what they are saying. Was Hundertwasser extradited from his own country? During the 2016 local body election campaigns, a rumour has been spread saying that Hundertwasser was ‘extradited from his own country’ (sic) because he was convicted of a crime. The source for this turns out to be an English 1986 newspaper. However, the key words that make up the claim are not part of the same article, or even from similar parts of the newspaper. For example Hundertwasser’s name appears under the ‘exhibitions’ section, whereas the other quoted words (like ‘extradition’) are from entirely unrelated news items. It appears that a Chinese click-bait search engine has compiled random excerpts from this newspaper into one of the millions of ‘stories’ on the web designed to promote ads for men’s (ahem) enhancement products. We couldn’t find these stories when we did a normal internet search, probably because of our benign search history (i.e., other users, with more… um… diverse search habits… might turn up this sort of stuff more easily). In a nutshell: a spambot put unrelated words together and somebody decided it meant something. It doesn’t. The bigger story here is our own consipracy theory; it seems the rumour was perpetrated by a vulnerable person under the influence of a shadowy group of more powerful conspirators. We’ll let you know who when we find out ourselves. Has there been a problem with WDC process around the HAC? There are no known issues, but the claim of ‘poor process’ has been made by a number of Councillors over the life of the project. In 2014 Phil Halse put forward a motion to discontinue to HAC project, claiming procedural objections, but it was pointed out that the procedural issues he was claiming had taken place during the time in which Phil Halse had been acting major, and actively promoting the project. His June 2014 motion, which passed, specifically rescinded all prior motions and commitments regarding the Hundertwasser Art Centre. In February 2017 Tricia Cutforth brought forward a motion to conduct a legal review of all decisions around the project going back to 2010. Most other councillors did not support the motion, with one stating it was initiated in bad blood. We cannot see how any decision prior to the motion to rescind could be relevant now, or why it would be worth spending between $25k & $40k on paying lawyers to review them. These types of ongoing actions by a few Councillors are seen by supporters of the project as simply attempts to undermine a project those Councillors do not personally support. Is there a $500,000 annual fee to the Hundertwasser Non Profit Foundation in Vienna? No. There is no annual fee at all. Is the clause about the marketing ‘code’ for the $500,000 annual fee? No. The clause about marketing in the original WDC/HNPF agreement simply clarifies that the Hundertwasser Non Profit Foundation would not take responsibility for marketing expenses. Legal documents don’t use code for $500,000 fees. Hasn’t PNT lied about the costs of insurance, freight and security? No. These costs have been explicitly included into the PNT proposal as part of operating expenses, as they were in the former HAC proposal. It is the international norm for these types of costs to be born by the exhibiting gallery. Is PNT purposely hiding who will be donating funds or underwriting the project? No. PNT confirms that it is quite prepared to enter into an agreement to go ahead with the project subject to appropriate due diligence being undertaken on funding and underwrite, as per any normal business transaction. PNT has never proposed to build or underwrite operating costs for the HWMAC from its own funds. Instead the Trust has been clear that it intends to enable and promote capital fundraising for the project and to identify and secure appropriate underwriting facilities. $2.5 million of lottery funding has lapsed but the Lotteries Commission have encouraged fundraisers to apply again once Council has resolved to pursue the project. A further $2 million of funds raised by or pledged to the former HAC project may still be available to the new project. Did WAMT or PNT or anyone else lie to Lotteries about x, y & z? No. Lotteries approved funding for the previous HAC project (from two separate Lotteries funds) with full information as to the intent and scope of the project, including the inclusion of a cafe/ restaurant and museum shop. The Lotteries Commission is overseen by the Department of Internal Affairs and do not fund projects without appropriate due diligence and research. Did PNT lie to the public about the funding expiring? No. Their proposal explicitly states that the Lotteries funding was secured until late October. Lotteries funds are contestable, so the funding was potentially open to other applicants from the day after the June WDC meeting that saw Council vote to drop the HAC. Soon after that meeting PNT discussed their intention to revive the project with the Whangarei Art Museum Trust (the original applicants for the funding) and the Lotteries Commission agreed to keep the funding available for as long as they were able. They were extremely accommodating but in the end could not extend the deadline past the WDC Extraordinary meeting (12 November 2014). The Lotteries Commission have invited fundraisers to re-apply at any point. It is worth noting that in a recent Radio National interview, Prime Minister John Key told reporter Lois Williams he recognised the merits of the project and said that ‘he would expect them to come and see him for help’ should the project be supported by Council in the future. You can listen to the original Radio National interview here. Does the centre need 160,000 people paying $20 each to cover costs? No. Visitors are estimated as being 140,00-160,000 per annum, but only 95,000 are needed for the HWMAC to be profitable. These figures are based on reports from Visitor Solutions, Crowe Horwarth & Deloitte (2011 and 2015). Are PNT really saying 495,000 people will pay to visit the art centre? No. That’s just a number a troll made up. PNT did cite the figure of ‘450,000’ in relation to the estimated total annual visitors to Whangarei (less than 20% of the current annual visitors to Northland) on one of their advertising placards. 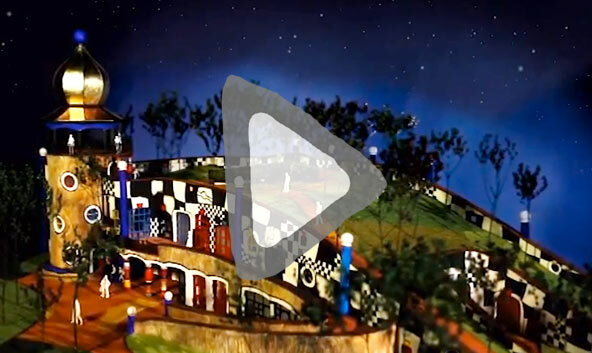 Was Hundertwasser a … (insert noun)? The only allegation made by the perpetrators of a smear campaign with a shred of evidence relates to the allegation Hundertwasser was involved in Hitler Youth. However, it is abhorrent that anyone knowing the facts would perpetuate this as a smear. And, if done in ignorance, it is unforgivable that they would make such allegations without a 10-second Google search. Refer directly to the Hundertwasser website for the complete transcription here. Hasn’t PNT lied about the jobs created? No. PNT has always quoted the Deloittes study on jobs created which states up to 32 jobs in the Arts Centre and the Museum shop and Cafe / Restaurant. These jobs do not include jobs used in construction (estimated 60-80) or jobs created in businesses that benefit from the Hundertwasser project. Matakohe’s 80,000 visitors haven’t had any spin-off effects, have they? Matakohe, with it’s population of 400 people, has two cafes and overnight accomodation. That is a 16% higher cafe-to-population ratio than Wellington, supposedly the city with the highest cafe-per-capita rating in the world (ahead of New York). It’s hard to get critical mass in a village of 400 people, but Whangarei already has a number of cafes, retail outlets and tourism facilities so the infrastructure is here to capitalise on extra guests. Is the pohutakawa tree going to be chopped down? Are the fishermen going to be chucked out of the Town Basin? However, there will need to be some changes to the current ‘ice road’ used by the few fishermen who access their boats for loading/unloading from that point of the harbour. The cost of this is included in the $2.8m required for Council to spend to get the building and surrounds to the point that the Hundertwasser refurbishment can proceed. Has the Whangarei Art Museum Trust conspired to raise funds for the project? Yes and no. Yes, they raised $5m funds for the former HAC project (at the request of the Whangarei District Council). No, they never conspired to do so. Is Deloitte too biased to fairly evaluate Harbourside? For this theory to stick, you’d have to assume Deloitte NZ was biased towards the Hundertwasser project way back in 2011 when they were commissioned to produce the Hundertwasser Art Centre Feasibility Study and Economic Impact Assessment. There is no evidence that there was any bias in the preparation of these reports, or that Deloitte did anything other than a fully professional job. Then you’d have to assume that any fictional bias Deloitte may have had then was held on to for all those years and is now having an impact on this new WDC commission, which is to provide (1) an independent evaluation of the Harbourside project so that it can be fairly assessed alongside the HWMAC project and (2) to refresh the existing 2011 evaluation on the HAC to correctly reflect the new HWMAC project. We’re very sure this is not the case. We doubt very much that any of the same people are involved. Or care. Lastly, you’d have to assume that the second consulting firm that WDC has hired, which is wholly separate to Deloitte and wholly removed from either project, to supply a peer-review of the Deloitte findings, is also in on the conspiracy. Or else they’d report a bias. So yeah, we doubt it. If anyone has any actual EVIDENCE of bias, we’d love to see it. To finish, if WDC had hired a firm other than Deloitte to start from scratch and create an entirely new evaluation for both projects (instead of a simple refreshment of the HWMAC project), they would need to spend several 100,ooo more ratepayer dollars and many more months. Have the Hundertwasser Foundation said they don't want anything to do with the HWMAC? PNT representatives visited the Foundation in Vienna in 2014, before submitting their proposal to Council, to ensure it had the Foundation’s support. PNT has confirmed that there is a regular, open and friendly flow of information between Prosper Northland Trust and the Hundertwasser Non Profit Foundation in Vienna. Both organisations are working together to achieve the same goal. What is true is that the Foundation has said it will have nothing more to do with the Whangarei District Council. Which is hardly surprising. What about that letter at the meeting? The letter Cr Martin read from at the WDC meeting on 25 February 2015 was from early 2014 – well before PNT even existed – and it referred to the HNPF’s failing relationship with the WDC and the old HAC project. We are unsure why Cr Martin thought it appropriate to quote from this out-dated source – we can only view as an attempt to mislead the public into thinking the Foundation does not support the current proposal. This rumour resurfaced recently, after Whangarei resident Norma Smith (who obviously hadn’t read our FAQs!) wrote to the Foundation to ask if support had been withdrawn. The Foundation replied, but from there on in things got a bit murky – it seems some of the reply was taken (out of context) and circulated widely (by a number of people, including Cr Greg Martin) as ‘proof’ the Foundation was not supportive of the PNT initiative. Fortunately the Foundation head Mr Harel was quick to pen an open letter dispelling this particular conspiracy theory once-and-for-all. You can read the Northern Advocate article about this most recent saga here. Aren't all the supporters just arty farty weirdos? Once we stopped sniggering at the ‘pringle jumper wearing luvvies’ imagery, we thought it was time to address this often used and utterly wrong nonsense. There are plenty of artists who support this project, obviously, as well as liberals and every other shade of political being. John Key is a supporter. So is Helen Clark and Winston Peters. This recent (21 May 2015) article in the Northern Advocate reports support from international brand guru Kevin Roberts. In Whangarei, our supporters include builders, farmers, retailers, accountants, architects, lawyers, boat builders, tourism operators, doctors, employers and employees, teachers and students… you get the gist. There are nearly 4,000 supporters on the Whangarei Loves Hundertwasser Facebook page and over 4,000 on the YES! list. Looking at a brief sample of our Facebook fans, we can see people who love fishing, motor sports, All Blacks fans, diving, arts, travel, extreme sports… everything you can imagine. The Chamber of Commerce – representing a large portion of Whangarei business people – supports it. NZ Tourism supports it. Sports people support it. Health professionals support it. You can check out some of the ‘letters of support’ that accompanied the original submission to Council here. Prosper Northland Trust – the people who have proposed this project and, when it wins at the referendum, the folks who will undertake to raise the money and get it built – are diverse in their skill set, expertise and business experience. All of them are involved in their own successful enterprises. You can meet them at their website here. Deloitte – one of the biggest business analyst firms in the world – reviewed the facts, figures, visitor numbers, build costs and budgets for the HAC project and confirmed that they are sound. Aren't the Council selling the building? This rumour came from this article in the Northern Advocate, which appeared only in their online edition on 1st April 2015. The Advocate chief reporter revealed the prank at midday. Can the 3-way vote be blamed on Hundertwasser supporters? No. Nothing to do with us. And you can’t pin the referendum on us either. At the now-infamous November ’14 WDC meeting – where Council met to decide the fate of the old Harbour Board building – WDC staff presented Councillors with three options to chose from. The options were those staff had decided (based on the matrix devised by the WDC 20/20 Committee and their own due diligence) were the 3 best from the 21 proposals they’d received. They were (1) Hundertwasser (which scored top on the matrix) (2) Harbourside (which came second) and (3) Demolition. HWMAC supporters fully expected Councillors to vote for the best proposal at that meeting. Instead, a motion was bought to dump Hundertwasser from consideration at all, and instead choose between Harbourside and Demolition. It’s unclear to this day who actually drew up this motion or even who delivered it to the Mayor, but it was defeated at the meeting. Another motion was then bought by Cr McLaughlin, that the choice between the 3 options be taken to referendum instead of decided at that meeting. All the Councillors (except the Mayor) voted in favour. Is there a problem with the resource consent on the HWMAC tower? No. Despite poorly-informed comments made in local media (Whangarei Leader 25/5/15) by WDC Councillor Cutforth, the project is fully consented, including the glorious golden Tower. “The Resource Consent was compiled by Reyburn and Bryant. The actual RC/Notification Assessment – Non Complying Activity (signed off by the WDC planner, 26th February 2013) was also signed off by an Independent Planning Commissioner (13 March 2013) and was received 14 March 2013. The building went through a very robust planning approvals system, as one would expect for a public building. Regarding the height infringement – yes, it does exceed the 20 meters, therefore it was considered as a Non-complying activity (actual tower equalled 24.0M). The conclusion from the planners (and signed off by the Commissioner) was that, “the visual impact of the turret is considered appropriate and the effects to be less than minor”. The only thing we can think of that will be obscured by the height of the Tower will be the top of the Pak ‘n Save. Did John Key say "YES!" and then "NO!"? Well, duh. The Government has not yet been asked to commit any funding to the project. That cannot happen until after the HWMAC project wins the referendum, when fundraising begins. So when did he say YES!? On Radio NZ last November John Key (in an interview with Lois Williams) clearly said (a) he thought the project would be of great value to Whangarei and (b) that he fully expected the project to be in contact with him personally about funding in the future. Prime Minister John Key said there were some strong arguments for building the Hundertwasser art centre in Whangarei. Mr Key said he was aware of concerns about the cost of the centre but, as Minister of Tourism, he was also aware of potential benefits. “I mean Hundertwasser’s a brilliant man in his day and the proposal was totally unique to Whangarei. It can’t be moved anywhere else. So it can only be built there,” he said. Mr Key said if the Whangarei councillors decided to proceed with the project, he would expect them to come and see him for help. Lastly, central Government (through the Lotteries Commission) committed $2.5m to the project last time around, from two different funds. We fully expect they’ll commit even more this time. Did Hundertwasser really say that? Many quotes attributed to Hundertwasser have been bandied around during the referendum campaign. Good quote! From what we can tell, he probably said exactly that. The thing is, he quite obviously did not mean it in reference to the old Harbour Board building, which he chose (from all the buildings in Whangarei) to be completely re-modelled in his style. To willfully attribute his words to this building posthumously is disrespectful, to say the least. Why do you want to destroy our heritage? Truly, we don’t. The Hundertwasser vision for the old Harbour Board building is not about demolition or destruction. It’s about renovation, re-invigoration and renewal. It’s taking a tired, composite building – currently in shocking condition – and re-purposing it as something new and exciting for the generations to come. It will be New Zealand’s biggest every ‘upcycling’ project (if you don’t think that’s a thing, Google it). Hundertwasser was about sustainability and recycling, not destruction. We fully understand the connection that people who have worked in that building still have to it. We ask them to imagine taking their grandkids up on the roof of the new art centre, sitting on the grass and describing to them exactly what the building used to be like, back in the day. (Note: regarding the ‘heritage’ status of the building – we understand that an application has already been made with Heritage NZ and turned down in the recent past. There is a new application in now, but there is no expectation that the end result will be any different). Was Hundertwasser an 'Eastern European'? Hundertwasser was a New Zealand citizen who was born and schooled in Vienna, Austria (Western Europe) and who also lived at various times in his life in Switzerland and France. He immigrated to New Zealand after purchasing land here in the 1970’s, became a full NZ citizen and is buried here in Northland, at his request. We are unsure of the purpose of the continual repetition of this geographically-challenged theory, but we sense racism and ignorance.